Turkish Aerospace Industries/Middle East Technical University: In this study belly landing of an unmanned mini air vehicle with low velocity impact on the soil and rigid ground has been investigated by explicit finite element analysis using MSC Dytran. Introduction: In this study belly landing of an unmanned mini air vehicle with low velocity impact on the soil and rigid ground has been investigated by explicit finite element analysis using MSC Dytran. Mini unmanned air vehicles which land over its belly on gravel, asphalt, cement, grass and hard soil might be exposed low velocity impact during landing due to reasons such as gusts which are beyond the control of human. Therefore, the main aim of the study was to investigate the effect of the loads due to low velocity impact on the structure of the air vehicle, and contribute to the design process. Low velocity impact analysis of the mini unmanned air vehicle has been performed separately for the fuselage and fuselage-wing combination with and without internal reinforcements, and the effect of adding different sub-structures to the analysis model has been examined. A damage zone, which has been experienced frequently due to hard landings in the real flight tests between the fuselage and the rear tail boom and which could not be predicted beforehand, has been located by the explicit finite element analysis. Determination of the particular failure zone by the explicit finite element analysis has provided valuable information towards design improvement. Figures below show the mini unmanned air vehicle during the belly landing and the location of the damage zone and the actual failure which has been experienced during hard landing. Figure below shows a sample simulation result of the fuselage without any internal reinforcement landing on a rigid ground. Von-Misses stress contours and the deformed shape of the fuselage is shown after 0.04 seconds following the impact. Non-existence of the internal reinforcements resulted in significant deformation towards the ground. Such deformations are very critical in belly landings UAVs since the wing must not contact the ground during the landing until the vehicle stops. MSC-Dytran simulations allowed the design to team to predict the approximate location of the failure zone in the tail boom. Figure below shows the stress built-up in the tail boom. The predicted location of stress built-up is almost coincident with the actual failure zone which was observed after hard landing. 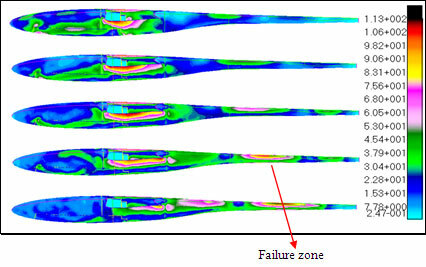 Prediction of the failure zone by MSC-Dytran explicit finite element analysis provided valuable information towards design improvement in the tail boom. Middle East Technical University, Dept. of Aerospace Eng.